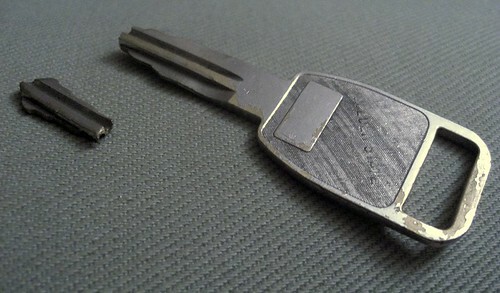 Broken Key, originally uploaded by aspiringameliorant. 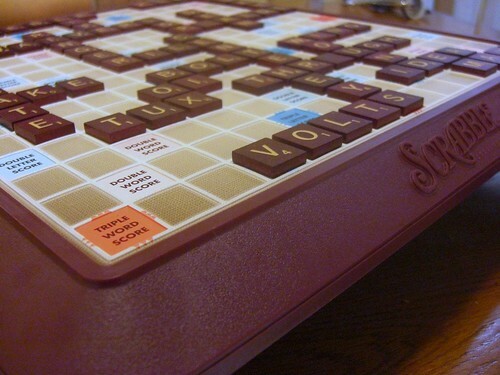 Scrabble 11/13, originally uploaded by aspiringameliorant. I think I play Scrabble all wrong. I keep thinking of words I want to play, not words I can actually play. Case in point: Our first word was "rile." I kept wanting to get the letters to spell "puerile." Just because it would have been awesome. Two of our friends are expecting a baby early next year. When they told us, I pretty much forced myself upon her, insisting on hosting the local baby shower. So figuring out what in the world I'd gotten myself into was one of my projects the past couple of weeks. 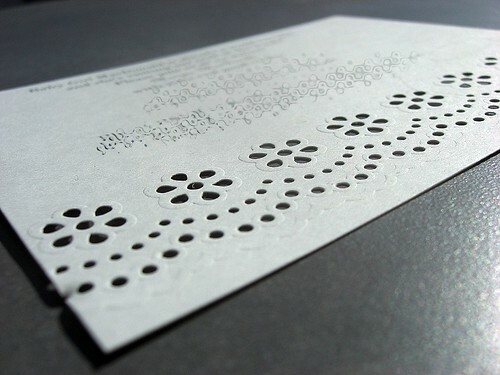 You already saw the invitations. I think that was when I was most stressed out. I had volunteered and then promptly put it in the back of my mind until my co-host reminded me that the honoree would only be in town for one weekend, so we should probably get a move on. Knowing the invitations were supposed to set some kind of tone, I mailed them out a few days later than I might have liked, trying to settle on exactly what we were going to do. Martha Stewart "Eyelet." A little girlier than I really wanted, but I already owned them (clearance from WalMart). I tried to make them a little less girly through use of color and background printing, but I had major troubles. I don't have a color printer, so I tried to save the file and take it to Kinko's, but their printer didn't want to print on weird sized paper, so I tried to take it up to the counter, and he was even more hesitant. So I ended up printing in black. I still have another box of the cards, so the ordeal has been duly noted. I'm not necessarily big pro-games, but since there were several sub-groups of people invited who didn't know each other, I thought it was advisable in this case. Yoruban. Born on a journey. Swahili. Born when father is in trouble. Children's book Pictionary. I wanted this one to tie in too, but looking at children's books from around the world, I just wasn't sure that anyone was going to be able to guess them. So I went through a list of the top 100 children's books in English, and picked out ones that I thought you could draw even if you didn't know the story (it would be extremely difficult to get Harold's Purple Crayon if you'd never heard of it, or to draw Stella Luna likewise). There was definitely an unfair advantage to the Americans in the group, so maybe next time I would come up with some other possibilities. But Pictionary is always fun, though now I have two easel-sized pads of paper, so I need to force our friends to come and play regular Pictionary. As I said before, I had a cold during the week leading up to the shower. So both because I was tired and didn't think people would necessarily want things made by me, I opted for more purchased than homemade goodies. Mini quiches and brownie bites from Costco, little cheesecakes from a mix on clearance at Osbornes, delicious cupcakes from a bakery in Memphis, brought by my co-host, and punch, cobbled together by my co-host from various ingredients that I thought sounded yummy at Target (blood orange Italian soda, raspberry lemonade concentrate, and Fresca). People definitely weren't as nibbly as I thought they might be, but there were leftovers for A. and another law school guy when they came by at the end. The Pictionary pad of paper was backed by some scrapbook paper that looked like railroad tickets, a little clothesline with baby onesies and socks strung up on ribbon that matched the giant bows on the mailbox and door (we live in a duplex which is not well marked, and is identical to 5 other units all in a row). Tablecloth from my collection--I actually ironed it though! I cut out another piece of scrapbook paper in a circle to put under the plates. A couple of Martha Stewart tissue paper puffs were hung at the last minute. And we actually used our punch bowl for perhaps the first time ever! I thought I was terribly clever when I spied the Andes mints in the aisle at Target, since baby and mom had just returned from a month in Argentina and are heading back now for another month. Apparently a little too clever for my own good, since everyone needed an explanation. Dispersed into individual little plastic bags with a header from some fabulous paper from World Market stapled on top. Most people didn't take any, but I think that made A. extra happy. I planned to help my friend with whatever kinds of random things she doesn't receive as gifts--baby bedding, burp cloths, blankets, etc., but didn't feel like that excused me from something to actually open at the shower. So I opted for probably the quickest thing I could think of--a nursing cover. This was the tutorial I used, but this looks closer to what I actually did. 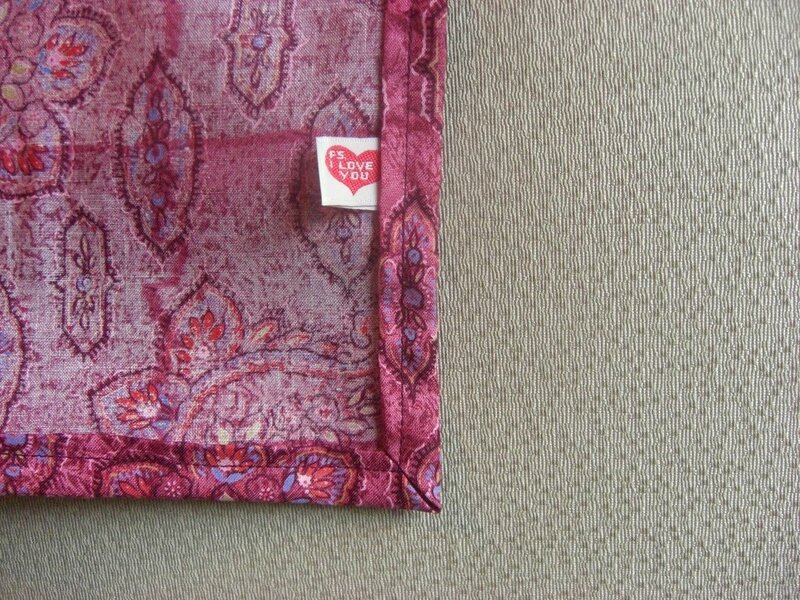 I see that the second tutorial suggests using home decor weight fabric, and I can definitely see the advantage. As it is, it seems likely to fly up with the smallest flailing of the wee babe. Also, the d-rings don't lock quite as well as they should, our would with a more substantial strap. I did include a little pocket made out of a baby washcloth and also wrapped up some breast pads. I should get a better picture of the fabric itself, but it's a dark pink with purple and yellow flourish-y designs that I picked up at Threadfest. You can see it in the first picture of that post. 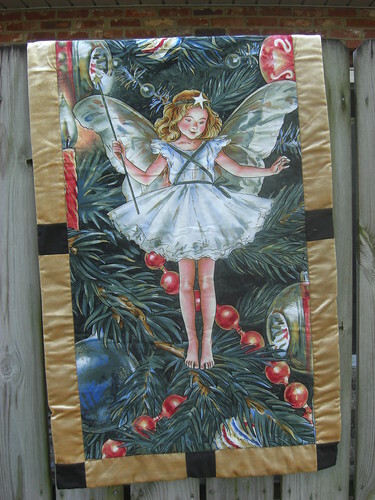 Christmas Fairy/Angel, originally uploaded by aspiringameliorant. After being sick and having other obligations that put me out of crafty commission for a while, I cleaned off my desk last weekend and started making lists. Because, you know, Christmas is less than two months away. And Advent, less than one. Actually, I feel like I'm in a pretty good place, but it definitely helped my panic to get things written down and all encoded (stars mean they have a Christmas due date, dots mean they're sociable projects, etc.). I'm not quite ready to forego sleep, but it's definitely on. And here's another idea for those upholstery samples. I had actually pulled the velvet out to see if it coordinated with some fabric I had for a pillow cover, but A. spied it when I was asking for his opinion on sashing for the fairy/angel panel. The black cornerstones are my way of disguising the too-short pieces, but I think it works. I just love that it looks all glowy and candlelight-y.